'After serving more than a decade in the House, I was elected lieutenant governor in 1994. I led an effort to revamp Hawaii’s workers’ compensation insurance laws, saving businesses millions. I also helped lead state efforts to improve early childhood education and promote Hawaii’s tourism industry through visa reform, issues I continue to champion in the U.S. Senate. As my party’s first female nominee for governor, although I lost the race in 2002, I wanted to keep other women running for office and founded the Patsy T. Mink PAC in 2004 to that end. Congresswoman Patsy Mink, for whom Title IX was renamed after her death, was my friend and continuing inspiration. In 2006, I was elected to Congress by voters in Hawaii’s second congressional district, representing the seat once held by Patsy. During my time in the House, our nation and state faced incredible challenges and opportunities. I supported struggling families by preserving Hawaii’s pre-paid health care law, teamed up with colleagues across the aisle to protect Native Hawaiian education programs, promoted food and energy sustainability and sponsored legislation to support Hawaii’s critical tourism industry and create jobs. 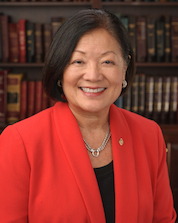 With the retirement of Senator Daniel Akaka, the people of Hawaii elected me to the U.S. Senate, where I serve as the first and only Asian American woman and first woman senator from Hawaii. It was a privilege to have worked with Senators Inouye and Akaka over the years, and I am working to deliver results for Hawaii by building on the strong foundations they laid. I serve on the Committee on Armed Services, Committee on Energy and Natural Resources, Select Committee on Intelligence, Committee on Small Business and Entrepreneurship, Committee on Veterans' Affairs, and am the Ranking Member of the Armed Services Subcommittee on Seapower and Energy and Natural Resources Subcommittee on Water and Power. All of these committees deal with issues important to Hawaii’s people.